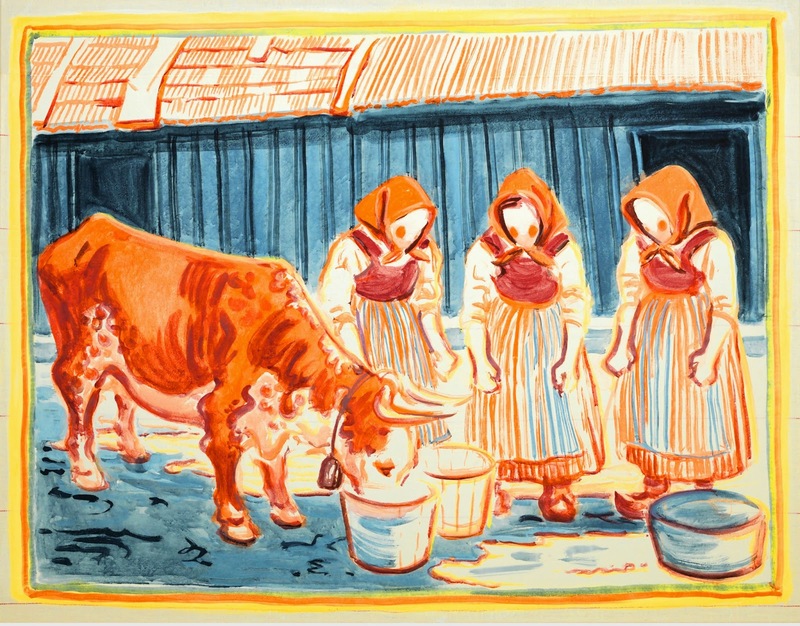 Anglo-Swede Sigrid Holmwood, whose family background is in farming, has studied how the peasant paintings of South West Sweden emerged from medieval sources. Seeing them as an alternative to bourgeois accounts of art history, she’s remade the types of brush, and the earth, mineral and plant-based pigments they used, and depicted the peasant painter’s world as one ‘full of magic, where meaning and emotion are inscribed into all materials, and the animal, vegetable, human and super-natural are all interconnected’. Her way of painting parallels returning to traditional farming in contradistinction to modern machine-dominated methods. 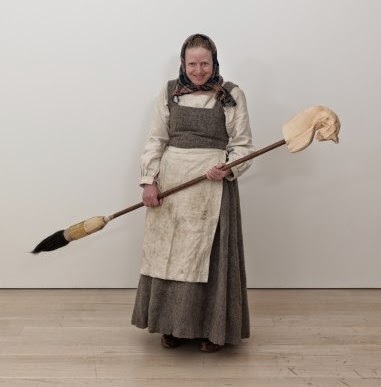 Holmwood’s lively style is at one with a filmed performance in which she rides a giant paintbrush-come hobby horse as if it were a broomstick…. Add spalting, secret hex signs, mycorrhizal relationships and the modern twist of using mushroom colours, and there’s plenty going on. Samara Scott describes her practice as a ‘slow digestion of cosmetic, edible and chemical cultural bedris’. That turns out to be largely a means of trapping the fluorescently pastel-coloured experiences of a synthetically freed body. 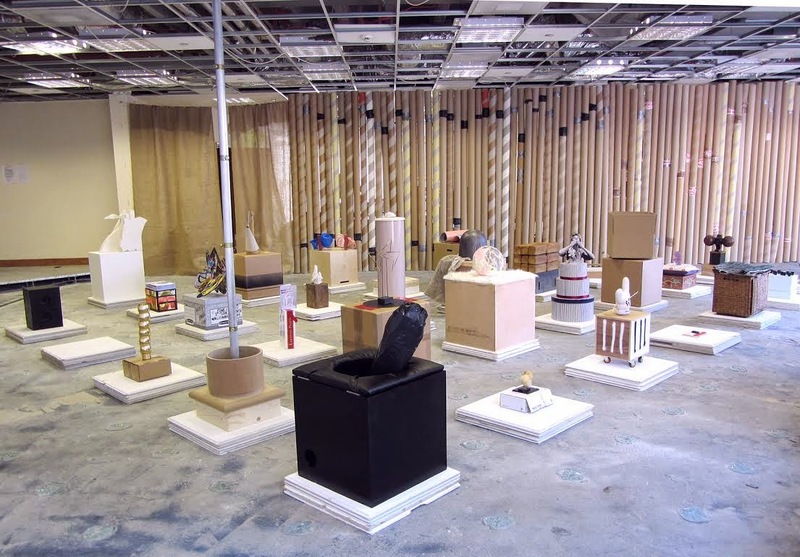 The key development in her language here are resinous horizontal paintings – come sculptural accumulations – come low tables – come flatbed scanners, raised on various props. Add a toothpaste drawing on the wall, rolls of sellotape inserted into textile, and a multi-hued painting featuring the gussets from tights, and plenty else, and you have one of five good reasons to visit Anita Z’s summer shows, the other highlights being a persuasive selection of Sam Falls’ paintings, sculpture and less often seen videos; and a rebooted version of Rachel Pimm’s excellent show from Enclave in April. Jonathan Trayte: Unifine and Rob Leech: Barry Box prominent and Sam Plagerson’s improbably-sized contribution at the back. This six-strong Anglo-Japanese curation by David Connearn can be viewed at two levels, and not just Laure Genillard’s ground floor and basement: on the one hand, a post- Heideggerian account of Kant which uses the linguistic coincidence set out in an accompanying newspaper that the English schema (plan) and the Japanese sukima (crevices) are pronounced the same as a starting point (phew!) or as a delicately beautiful collection of interventions which contrast eastern gradations (Yasuko Otsuka’s subtle duochrome lithographs on cotton, Yoko Terauchi’s shifting perspective of the gallery space using graphite on paint to shadow the floor, Hakudo Atsuo’s silver dust drawings) with western clarity (Gary Woodley’s line sliced through the stairs, Kenneth Dingwall’s more logical colour-sets, Tom Benson’s white painting with an accompanying text which makes for a neat face-off with the canvas at the centre of Yasmina Reza’s play ‘Art’). Recommended either way. 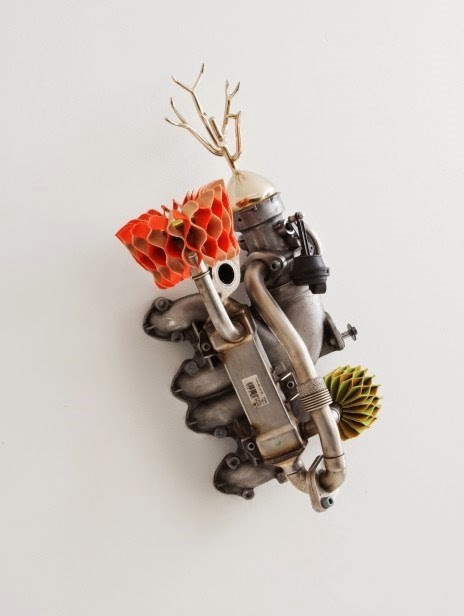 Young Japanese artist Keita Miyazaki has a resonant-enough central idea for his new sculptures, which look to create some sort of utopian mode, however ironic, out of post-tsunamic landscape by combining parts of old car engines, festooning them with colourful origami forms, and building in public jingles from the Tokyo soundscape. That said, I can imagine it turning null, but Mizazaki’s forms take on an unpredictable almost animal life as their contrasts hint at post-recessionary flowering, industry in the community, and party streamers threatening to trump environmental issues. The no-nonsense aesthetic and political charge of the car engine have made it a fairly frequent component of conceptual art – see Thomas Bayrle, Matthew Barney and Roger Hiorns (though not John Chamberlain: ‘I didn’t want engine parts, wheels, upholstery, glass, oil, tires, muffler systems or transmissions. Just the sheet metal’). 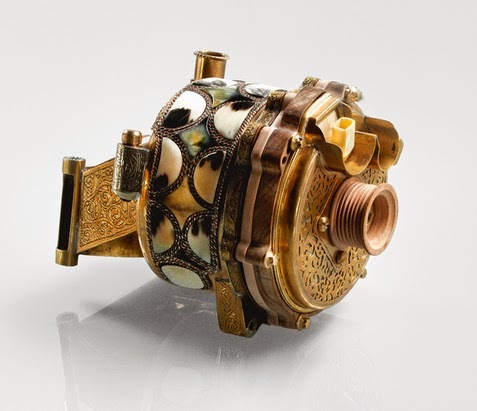 V12 Laraki: Alternator (2013): Yellow copper, red copper, nickel silver, mahogany wood, cedar wood, cow bone, sand stone, cotton, ram’s horn, cowskin, tin, chinese superglue and cow horn. 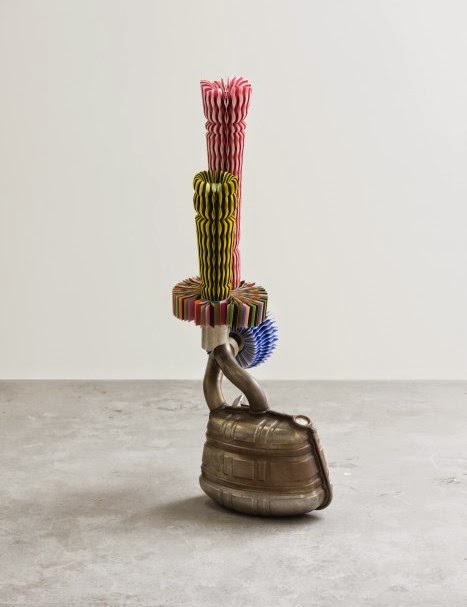 In an unusual twist on work not being what it seems, the apparent bling of intricate abstract sculptures in the second show of the third gallery to use this spacious former church hall is far from the point. Rather, they’re part of a project which revisits a failed dream of manufacturing a luxury sports car wholly in Morocco by commissioning to-scale versions of the 463 components in the Mercedes V12 engine which Abdeslam Laraki was eventually forced to use in the ‘Luraki Fulgara’. As such, it’s a social sculpture project orchestrated by the multi-national Van Hove to empower 57 of the estimated three million self-employed Moroccan craftsmen to make something other than tourist fodder. They worked reclaimed and traditional materials such as cow bone and recycled aluminium to the point of looking precious, so harnessing traditional skills in a sort of reverse engineering of factory line production.